Tyler Perry's latest movie, NOBODY'S FOOL is now showing in cinemas in Nigeria! 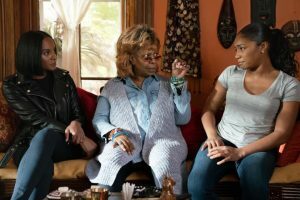 Nobody's Fool is a drama and comedy rolled into one and with comedians, Whoopi Goldberg and Tiffany Hadish in the movie you are in for a roller coaster of laughs and craziness all the way! The movie centers around two sisters, wild child ex con Tanya and level headed Danica (Tika Sumpter) who is in an online relationship with a man she has never met. Find out how Tanya discovers that her sister's picture-perfect life may not be what it seems and how together they take revenge on this man who has been deceiving her all along. Nobody's Fool is written and directed by Tyler Perry and is his first R rated comedy. Follow them on all their social media handles for FREEBIES which include movie tickets among other things.